Xinyu city is one of the 11 prefecture-level cities in Jiangxi, a southeastern Chinese province. With approximately 1.2 million population, Xinyu is reportedly the province’s most economically-advanced city. According to information received by Bitter Winter, since last year, crosses in at least 281 Protestant congregation sites in the city have been torn down, including some that belong to the government-approved Three-Self Church. Additionally, 81 Protestant congregation sites have been shut down, 16 of which were demolished. The cross of a church in Shuixi town’s Chongjiang village was concealed. 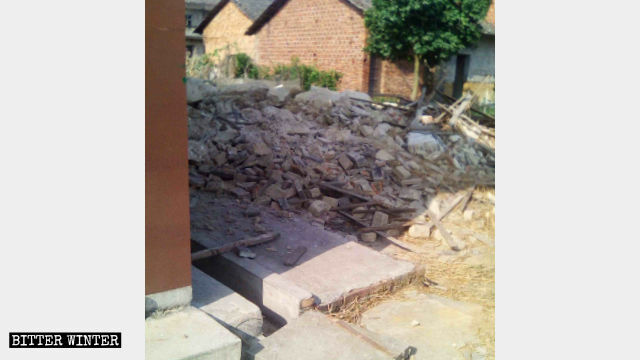 On November 13, 2018, authorities forcibly demolished a house church congregation site in Jiangjia village, under the administration of Shuixi town, on the grounds that they “were afraid the building would collapse and kill someone.” The church members, however, have reported that the congregation site was structurally stable. Four months previously, the government banned congregations at the site, claiming it didn’t have necessary permits. Jiangjia villagers reported that due to new stricter regulations of religious venues, the village head was previously fined 10,000 RMB (approximately $1,428) for “failing to keep the theists in control” and not putting enough effort into the management of religious affairs. A congregation site of Tangxia house church in Zhentian village was forcibly demolished. Some congregation sites have been forcibly sold or demolished through authorities’ deception, like a church in Luosha village, under the administration of Xinyu’s Huze town. In July 2018, after the church was shut down, government officials demanded that the chapel be rented free of charge to the village Party branch for its meetings. When the church head refused, the village Party secretary threatened to sell the church; if it weren’t sold, it would be demolished. The church head had no choice but to sell the congregation site. 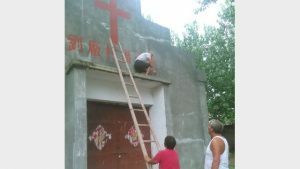 A month earlier, a house church congregation site in a village under the administration of Xinyu’s Luofang town also fell victim to the government’s manipulations. First, government officials made members of the church register with the Three-Self Church. While the believers were out to do so, the officials seized the opportunity to demolish their congregation site. A congregation site in Luofang town’s Huaijiang village was demolished. 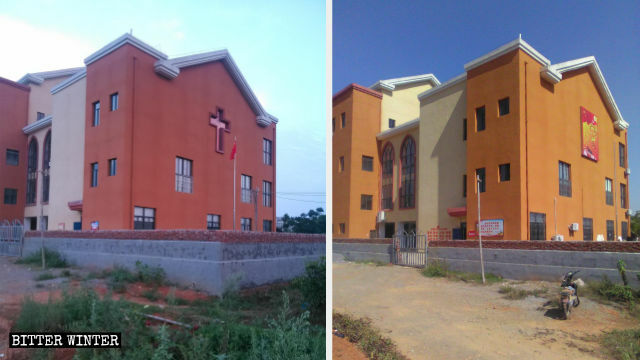 Forced repurposing of congregation sites has occurred in Xinyu city as well. In May, part of the walls surrounding a congregation site in Xinyu’s Hexia town was torn down, and the site was merged with the next-door village committee assembly hall and turned into an exhibition hall. After the takeover, the head of the congregation site applied to authorities to build a new church, only to be refused and rebuked by the village secretary that the government was not allowing for religious congregations. 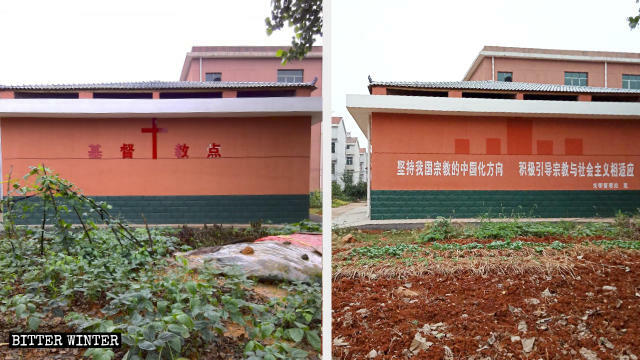 The cross and name of a church in Xinyu’s Guangming village were removed. 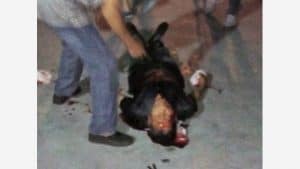 And just like in Henan, where the persecution of Christians has been reported to be most severe, Xinyu government is also forcibly entering believers’ homes to remove crosses and religious paintings, and households that were receiving welfare, who refused to give up their religious beliefs, had their subsistence allowance canceled.